OxCoach is a powerful coaching tool designed specifically for the needs of Oxford college and squad rowers. In the boat, OxCoach displays your stroke rate and speed. The app also transmits your location and speed information online, so that your coach or spectators can follow your boat from the bank in real time using OxBump. In the boat, OxCoach calculates your stroke rate (using your iOS device’s accelerometer) and speed (using its GPS system). This information is presented in an easy-to-read format that can give your cox direct feedback on the speed boost of your pushes, or provide your stroke man with a secondary rate display. Speed is presented as a 500m split and as percent of the current world record speed. Boat types without FISA world record speeds are compared to Women’s Henley records, Lightweight Varsity records, or the venerable honey badger as appropriate. 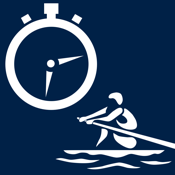 A simple stopwatch function is provided to make it easier for coxes to time pieces. OxCoach broadcasts your boat’s speed, stroke rate, and location so that coaches and spectators using OxBump can see your boat in real time. Coaches can call up a display identical to the one available in the boat. By mounting their iOS device on their bicycle, a coach can watch a crew’s progress in real time without straining to see the cover or counting stroke rates. Spectators enjoy seeing a map of the river with college icons representing the boats out training. On race day, spectators can watch boats chase each other down the river before they come into view. More experienced observers might be able to deduce bumps based on boats pulled clear of the racing line, or see how much longer a delay will go on based on whether the competitors have reached their starting positions. Additionally, this app works anywhere you have internet coverage. So if you are coaching a Head of the River Regatta crew and want to know when to duck out of the pub to give them a cheer, OxCoach can help. If you are coaching a whole fleet of boats from a launch, OxCoach will let you see where your crews are, and track their rates and speeds. The possibilities are endless! One of the core features of OxCoach is its broadcast of boat position and speed for coaches and spectators to use in real time. The motivation behind this app is to create a world where spectators watch bumps racing live on a moving map. We need test data in order to make this a reality. Keep in mind that this app does not transmit any information that isn’t readily apparent to a spectator on the bank, and you can turn it off any time you’d like. You can also identify yourself as “Mystery Boat” if you don’t want to reveal how quickly you zoom up and down the river. In that case, may I also suggest painting your blades.